Principal Thomas explains the importance of being multilingual at the 2017 World Language Competition awards ceremony on March 30. 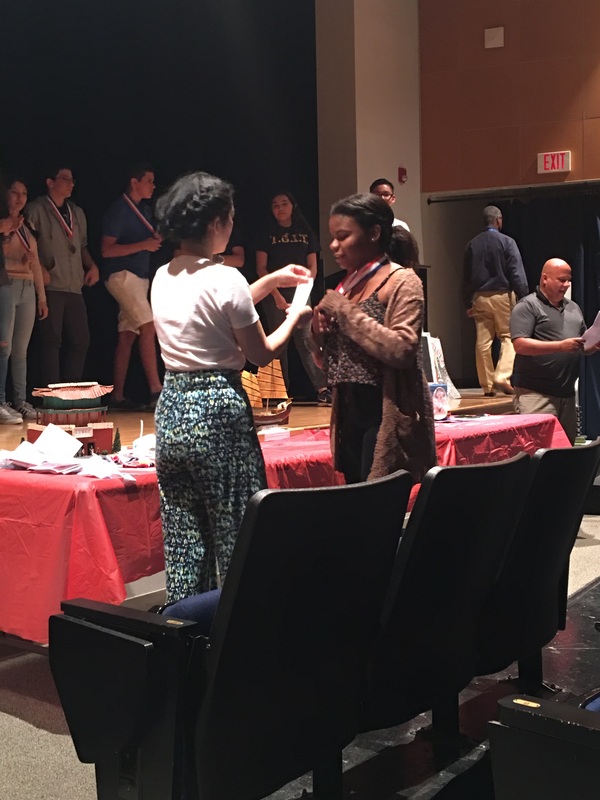 Principal Thomas encouraged students to partake in events like the World Language Competition because it promotes multilingualism within the student body. Ms. Hill, along with National Spanish Honor Society (NSHS) members seniors Wady Valeriano and Anaeli Garay present their awarded scrapbook from the World Language Academic Competition on March 30. NSHS used its scrapbook as a way to broadcast the message of cultural unity with the title “Héroes sin Barreras” (Heroes without barriers). Awarded juniors Esmeralda Cedillos and Katerina Argianas discuss why they decided to participate in the 2017 World Languages Academic Competition at the awards ceremony on March 30. “I like to talk in public so this competition was really fun to do for me,” Cedillos said. Argianas added,”Spanish is a fun and exciting language and I was really happy to be able to participate in the competition.” Language students were able to display their skills through the 2017 World Language Academic Competition where they spoke their language and recited pieces or performed popular culture songs.